He's just losing it . . .
Donald Trump late Friday accused Hillary Clinton of intentionally stacking debates against primetime programming to “rig” the election process, despite the fact that the schedule has been set since last September. . . The preliminary debate schedule for the general election has been set since September, 2015, by the non-partisan Commission on Presidential Debates . . .
Donald Trump lamented Friday that Hillary Clinton did not congratulate him during her acceptance speech at the Democratic National Convention. . . . During a rally in Colorado Springs, Trump said he tuned in to Clinton's speech "out of curiosity" to see if Clinton would mention his name and was disappointed she didn't congratulate him for winning the GOP nomination. "I was curious to see whether she'd do a class act and not mention my name," Trump said. "Or mention it with respect, like, say, 'I'd like to congratulate my Republican opponent for having done something that nobody has ever done in the history of politics in this nation.'" Thinking about the quote, above, is Trumpy trying to lay the groundwork for getting out of the debates (which would be a disaster for him)? Ghazala Khan: "First of all, I think all America who listened from their heart to my husband’s and my heart, and I’m so grateful for that. It was very nervous because I cannot [look at] my son’s picture. I cannot even come in the room where his pictures are. And that’s why when, I saw [his] picture [on the video screen behind me], I couldn’t take it. I controlled myself at the time. So it was, it is very hard." Ghazala Khan: "I begged my son, I begged him, do not come back a hero, come back to me a son. He came back a hero." The new RABA Research tracking poll shows Hillary Clinton has opened a significant lead over Donald Trump, now leading him by 15 points, 46% to 31%. 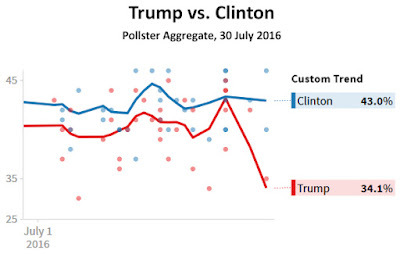 . . A similar poll conducted the day after the Republican convention showed Clinton ahead by only five points. 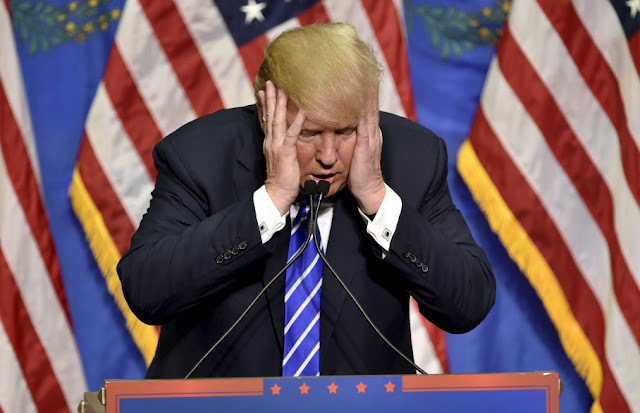 “Donald Trump, confronting a daunting electoral map and a significant financial disadvantage, is preparing to fall back from an expansive national campaign and concentrate the bulk of his time and money on just three or four states that his campaign believes he must sweep in order to win the presidency,” the New York Times reports. . . .
Trumpy's been reduced to this. Sad! So, Trumpy reaches out to the Koch Bros, because he is clearly having money troubles and apparently doesn't want to spend his own money. They tell him no. So, what does he tweet? "I turned down a meeting with Charles and David Koch. Much better for them to meet with the puppets of politics, they will do much better!" Perhaps the hardest thing to do in contemporary American politics is to imagine how the world looks from the other side. . . .
Half of the Democratic delegates were people of color. For Republicans, it was only 6%. As soon as Khizr Khan finished his speech, "register to vote" spiked as a Google search. After promising a “showbiz” Republican National Convention that would dazzle the American public, Donald Trump shrugged off responsibility for staging it . . .
“This is more than just a campaign setback for Trump. It’s a setback that cuts right to the core of what Trump considers valuable about himself.” . . .
[Gallup] "Trump's speech got the least positive reviews of any speech we have tested after the fact: 35% of Americans interviewed last weekend said it was excellent or good. Of the nine previous speeches we have rated, the top one was Barack Obama's in August 2008, which 58% of Americans rated as excellent or good. The lowest-rated speech other than Trump's was Mitt Romney's in 2012, with 38% excellent or good. . . . The self-reported net impact of the GOP convention was also negative. Overall, 51% of Americans say the convention made them less likely to vote for Trump, while 36% said it made them more likely to vote for him. This is the highest "less likely to vote" percentage for a candidate in the 15 times Gallup has asked this question after a convention. The previous "less likely" high was 38% after both conventions in 2012, and after the GOP conventions in 2004 and 2008." A CNN instant poll right after the Republican and Democratic conventions finds that Hillary Clinton gave a much more effective speech than Donald Trump. 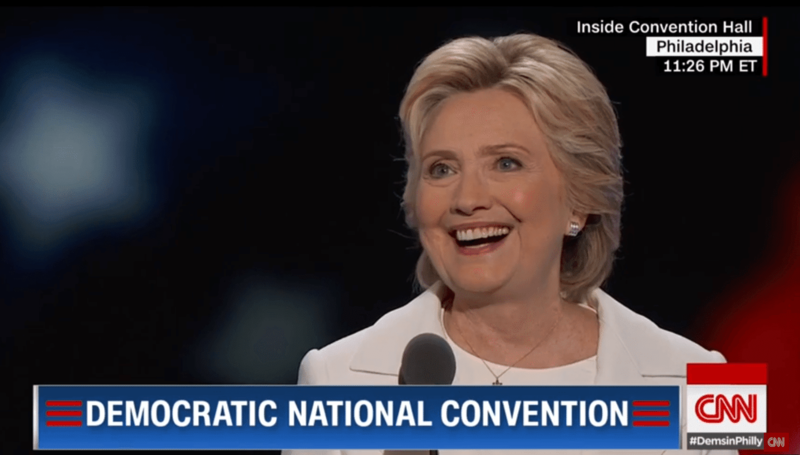 71% had a “very positive” reaction to Clinton’s speech, as opposed to 57% for Trump. Yes, Trumpy actually said "no more Mister Nice Guy" and "I'm taking the gloves off." So you know that gentle, respectful campaign he's been running? That's all over now. He really seems to believe that people want to see more Angry Trump. I say, great! Mike Pence, who has the most miserable job in politics, tries to accuse Obama of name calling. NAME CALLING! Trump himself is not one to shy away from taunting nickname: Crooked Hillary, Lyin' Ted, Pocahontas (for Masschusetts Sen. Elizabeth Warren) and Little Marco are staples of his repertoire. . . .
What do polls mean now? Both candidates will now get a classified intelligence briefing. Is it unthinkable that the undisciplined orange-faced one will blurt something out? This would be the third cyberattack on Democratic party groups . . . BUT REALLY, FOLKS, ENOUGH ABOUT ME . . .